$199.99 & FREE Shipping on orders over $59. When you’re new to brewing, knowing what to buy & how to put it together can be challenging. Making a mash tun out of a beverage cooler is one of those projects you might not be ready to tackle on your own. Here at MoreBeer! we’ve gathered all of the components, and built a cooler mash tun for you! 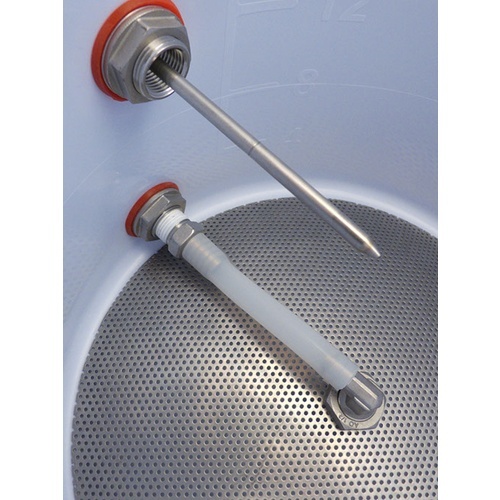 This 10 gallon Cooler Mash Tun with Thermometer includes our AG330 mash tun with the addition of a built in thermometer. The 3" thermometer with 6" probe is preinstalled in the MoreBeer! shop. 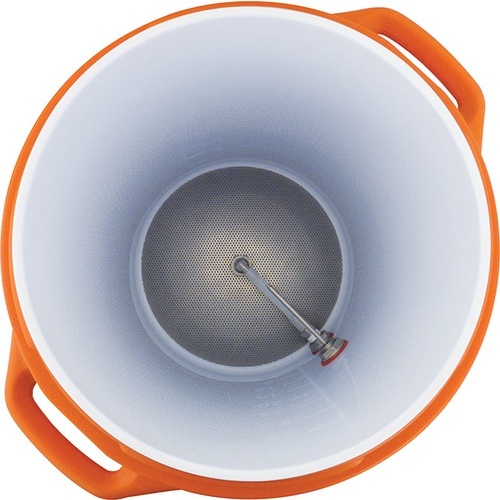 Installing a thermometer on an insulated cooler mash tun is tricky because you have to drill a larger hole in the orange plastic without damaging the inner white plastic wall. However, it is worth it. Now you can see the temperature of your mash without taking off the lid! High quality bi-metal thermometer with 3" face and 6" probe. Internal dimensions are 18.375"H x 12.875"D.
External dimensions are 20.875"H x 15.875"D with lid on. To start all grain brewing. This is better than my home-made 25 year old set-up. how many gallons needed to reach thermometer probe ? BEST ANSWER: I regularly mash 10-12 lbs grain in 3-4 gallons water and the water line for that mix is at least a couple inches above the probe. By actual measure 3.5 gallons will cover the temp probe. Thermometer is perfectly accurate against my Thermapen. False bottom and ball valve are very good quality. Holds my mash temp within a degree for a 60 minute mash. 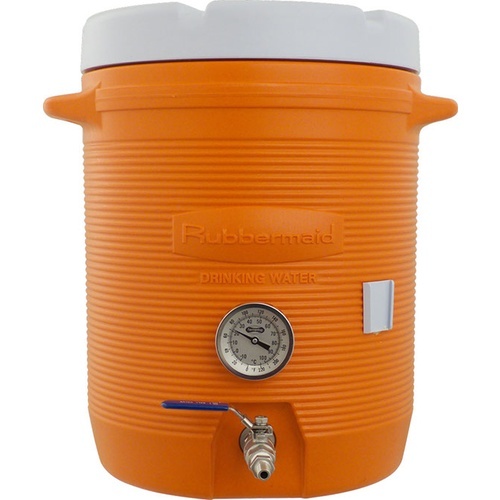 I ordered this product because I screwed up my mash tun cooler when I tried to add a thermometer on my own. Everything looked to be hooked up and ready to go when the mash tun arrived...but after I cleaned it and then used it for my first brew, I found it leaked from both the spigot and thermometer areas..not fast, but enough to cause a mess. The other problem here is the liquid leaked into the insulation and I'm concerned it will negatively effect the insulation properties of the cooler in the future. Frustrated...may just have to go back to a simple cooler with a floating thermometer. Hi Barry - The insulation should still be fine. Did you ensure all fittings were snug prior to use? Shipping and handling can loosen them upon reaching destination. Great buy for the price! Nice mash tun.Would have given it 5 stars,but the 6 inch thermometer probe gets in the way of mixing the grains. Awesome Mash Tun that holds temp within a degree or two! The fittings are top quality and the false bottom is nice. I use a bag for the grain for nice clear wort -- but the the false bottom works well on it's own. Over all -- this MT will last! I did a lot of shopping around and priced out various options to DIY one of these. Couldn't really beat the price here so just bought this already assembled. Glad I did. Turn-key is great! Fast delivery and mash tun hold temp very well. Now that I have figured out this new toy my brew house efficiency has gone up 5 to 7 points. I had a similar setup with a 5 gallon version that I made but I wanted to be able to do stronger 5 gallon batches and generally more quantity so I purchased this and it was the best decision ever. The thermometer is as accurate as my handheld, everything is easy to clean and having a reliable way to move wort from my mash-tun to the kettle with the ball valve has made my brewing life easier and stress-free. This is an affordable unit with everything already built in for those less DIY inclined. 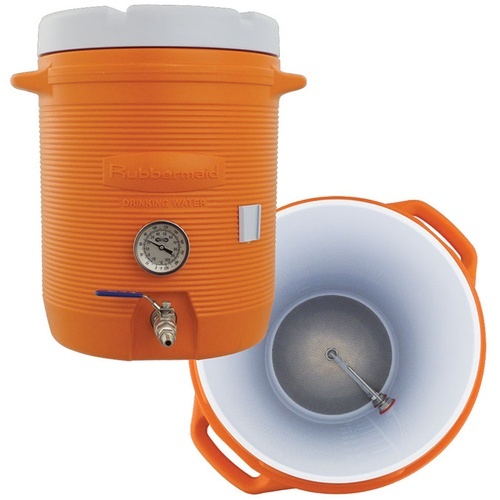 I can't recommend the Cooler Mash-Tun enough, if you're already using a 5 gallon version like I was, this upgrade is a no-brainer.